It is official. If there was any niggling—read really minute—doubt that Barack Obama was perfect, put it aside. His wife is still in love with him. He's funny, he's kind, he even asks to hold babies, he's considerate, he's liberal, he's athletic, he does not even yell. Becoming by Michelle Obama, a memoir written compellingly, is an ode to the man whose eyes crinkle when he laughs. The book is as much about Michelle as it is about her relationship with Barack. She vividly describes growing up with her parents, brother, and her great aunt Robbie who gave her piano lessons which, for Michelle, were a daily battle. In the determined, willful and talented young girl who refuses to follow a structured music programme, you see a little of the composed and candid first lady she grew up into. Her parents later moved into the White House and charmed its staff by insisting on washing their own clothes. And then there is the perfect romance. Becoming is really a love story. 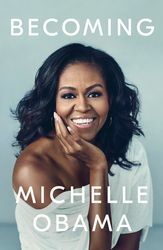 Michelle chronicles it all—the first time she met Barack, their first kiss, the long-distance relationship and the marriage.The book, however, gives a curated vision of their lives. The ugly bits which make up all marriages have been air-brushed out. There are fights, but they are rare. The couple once went to a marriage counsellor when Barack was running for the senate and their daughters were still very young. Barack was “reluctant at first” to sit across a stranger and talk; he preferred to buy a relationship book. But they successfully overcame the rough patches. Michelle does not deviate. This is what is slightly, if perhaps a little irrationally, disappointing. She has come to occupy such a high place in the world—especially with that no-nonsense, formidable speech she gave about Donald Trump—that you hope she will let you into some of her inner secrets. That her life, her husband and her personal challenges will, in some way, mirror the messy ugliness of the lives that most of us live. This, however, is not to be. Michelle remains the goddess, even when she is expressing her anxiety about being referred to as the angry black woman with a lot to say, and the ultimate American story. There is the settling into the White House, the frustration with all the attention to her clothes, her faux pas, like when she laid her hand on the shoulder of Queen Elizabeth, who reminded Barack of his grandmother Toot. The only time Michelle lets the mask slip a fraction is when she writes about trying to conceive through IVF. “Fertility is not something you conquer,” she writes. “Rather maddeningly, there is no straight line between effort and reward.” She talks about squeezing in attempts to get pregnant in the middle of the Illinois legislative schedule, mustering the courage to inject a needle into her thigh and feeling frustrated at “the acute burden of being female”. “I sensed already the sacrifices would be more mine than his,” she writes. “In the weeks to come, he would go about his regular business while I went in for daily ultrasounds to monitor my eggs. He wouldn't have his blood drawn. He wouldn't need to cancel any meetings....” Other than that, Michelle has been successful in fixing the Obama halo considerably tighter. It is about legacy.